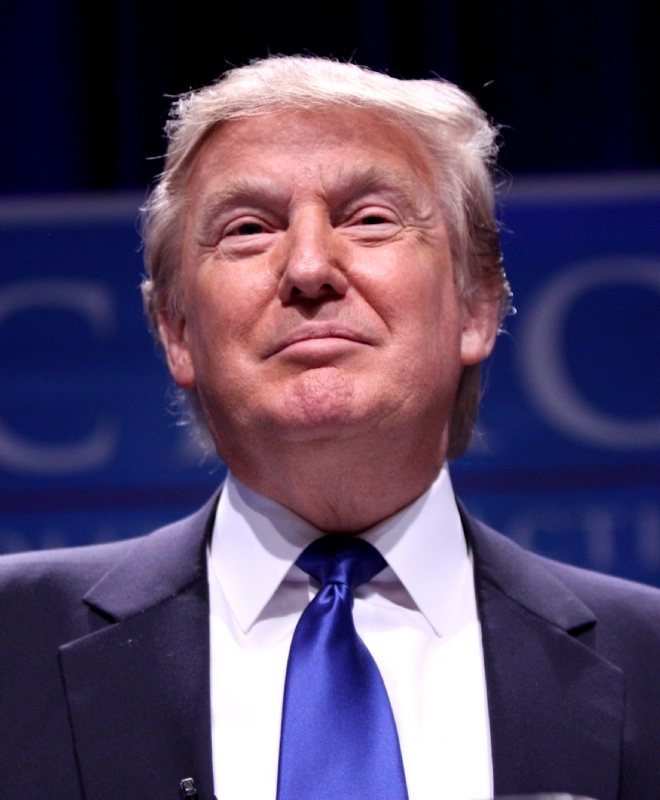 Donald Trump is a famous Businessman from USA, he is 72 years old and still alive, born June 14, 1946. 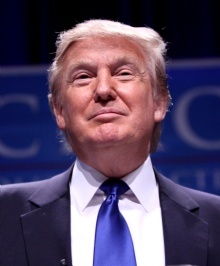 He is best known for its many skyscrapers he has purchased or been listed in Manhattan, several of which have been named after him, including Trump Tower on Fifth Avenue, Trump World Tower near the United Nations, and the Trump International Hotel and Tower at Columbus Circle . In 2004, Trump producer and host of NBC's reality show, The Apprentice, where participants compete for a management job at the top level in one of Trump's companies. The other participants are fired. The winner of the program receive an annual salary of 250,000 dollars. At the end of each episode, Trump eliminates one participant by saying "You're fired!". He is born under the zodiac gemini, who is known for Communication, Indecision, Inquisitive, Intelligent, Changeable. Our collection contains 47 quotes who is written / told by Donald, under the main topic Life. "Every time you walk down the street people are screaming, 'You're fired!'" "Do you mind if I sit back a little? Because your breath is very bad"
"China gets their oil from Libya. Why isn't China involved? They're going out spending billions of dollars a day on trying to take over the world economically. And we're spending billions and billions and billions of dollars on policing the world. Why isn't China involved with Libya? That - we don't get oil from Libya, China does"
"But I believe in fair trade, and I will tell you, I have many, many friends heading up corporations, and people that do just business in China, they say it's virtually impossible. It's very, very hard to come into China. And yet, we welcome them with open arms"
"As long as your going to be thinking anyway, think big"
"Anyone who thinks my story is anywhere near over is sadly mistaken"
"All of the women on The Apprentice flirted with me - consciously or unconsciously. That's to be expected"
"A little more moderation would be good. Of course, my life hasn't exactly been one of moderation"
"A certificate of live birth is not the same thing by any stretch of the imagination as a birth certificate"
"Well, I am a Republican, and I would run as a Republican. And I have a lot of confidence in the Republican Party. I don't have a lot of confidence in the president. I think what's happening to this country is unbelievably bad. We're no longer a respected country"
"Today, and I'm very strongly against tax increases"
"The point is that you can't be too greedy"
"The first thing the secretary types is the boss"
"The debt limits have to come down. The whole world of debt has to be changed as far as this country is concerned. We have to create jobs and we have to create them rapidly because if we don't things are just going to head in a direction that's going to be almost impossible to recover from"
"The Arab League tells us to go in and take out Qaddafi. We've spent billions of dollars already with respect to the Arab League. Billions of dollars, because they told us to do it. Why aren't they paying for it? They don't like Qaddafi, Qaddafi's been a terrible thorn in their side"
"The 1990's sure aren't like the 1980's"
"That's one of the nice things. I mean, part of the beauty of me is that I'm very rich. So if I need $600 million, I can put $600 million myself. That's a huge advantage. I must tell you, that's a huge advantage over the other candidates"
"It's always good to be underestimated"
"If you're interested in 'balancing' work and pleasure, stop trying to balance them. Instead make your work more pleasurable"
"If you're going to be thinking, you may as well think big"
"If you look - look at - I mean, look at what's going on with your gasoline prices. They're going to go to $5, $6, $7 and we don't have anybody in Washington that calls OPEC and says, 'Fellas, it's time. It's over. You're not going to do it anymore.'" "I'm the No. 1 developer in New York, I'm the biggest in Atlantic City, and maybe we'll keep it that way"
"I'm a bit of a P. T. Barnum. I make stars out of everyone"
"I wasn't satisfied just to earn a good living. I was looking to make a statement"
"I try to learn from the past, but I plan for the future by focusing exclusively on the present. That's were the fun is"
"I think Ronald Reagan was one of the great presidents, period, not just recently. I thought he had the demeanor. I thought he had the bearing. I thought he had the thought process"
"Love him or hate him, Trump is a man who is certain about what he wants and sets out to get it, no holds barred. Women find his power almost as much of a turn-on as his money"
"What separates the winners from the losers is how a person reacts to each new twist of fate"
"One of the key problems today is that politics is such a disgrace, good people don't go into government"
"I think Les Moonves is the most highly overrated person in television"
"I support health care for people. I want people well taken care of. But I also want health care that we can afford as a country. I have people and friends closing down their businesses because of Obamacare"
"I saw a report yesterday. There's so much oil, all over the world, they don't know where to dump it. And Saudi Arabia says, 'Oh, there's too much oil.' They - they came back yesterday. Did you see the report? They want to reduce oil production. Do you think they're our friends? They're not our friends"
"I mean, there's no arguing. There is no anything. There is no beating around the bush. "You're fired" is a very strong term"
"I have made the tough decisions, always with an eye toward the bottom line. Perhaps it's time America was run like a business"
"I don't make deals for the money. I've got enough, much more than I'll ever need. I do it to do it"
"I could never have imagined that firing 67 people on national television would actually make me more popular, especially with the younger generation"
"Getting things done in this country, if you want to build something, if you want to start a company, it's getting to be virtually impossible with all of the bureaucracy and all of the approvals"
"Experience taught me a few things. One is to listen to your gut, no matter how good something sounds on paper. The second is that you're generally better off sticking with what you know. And the third is that sometimes your best investments are the ones you don't make"